TSPFundTrading.com, LLC is a leading professional financial service that provides expert market analysis of the Thrift Savings Plan funds. Our primary objective is to help Federal employees and members of the uniformed services, including the Ready Reserve increase their Thrift Retirement Savings in a low-risk/high-reward manner in both bullish and bearish markets. Our service has been live since Jan 1, 2005. As you know, the Thrift Savings Plan (TSP) is an extremely important part of the federal retirement system. The TSP is widely recognized as one of the finest, most elegantly simple, and popular retirement plans of its kind. As of August 31, 2017, there were more than 5 million participants and over $500 billion in assets under management. The TSP is the largest defined contribution retirement plan in the world. However, we have found that the majority of these investors do not have the proper guidance required to maximize the growth of their savings. Our service is exclusively devoted to helping federal employees increase their thrift retirement savings. Our proprietary methodology uses technical analysis and gathers statistical information from trading activity to forecast the price direction of the Thrift Savings Plan funds. Our track record speaks for itself! Since the inception of our service on January 1, 2005 to the end of 2017, if a member started with $100,000, his/her initial savings would have increased to $595,915 using our real-time trading returns. For the same time period, the buy-and-hold strategy of investing would have only increased to $220,775, while the G Fund increased only to $149,600. These results do not include any personal contributions during those 14 years, nor any contributions and profits made during year 2019. In addition, our returns are not compounded and are only based on arithmetic computations (i.e., summing profits and losses). The two main facts to observe from the table are: (1) the longevity of our service, and (2) our results consistently outperform the buy-and-hold strategy of investing over the long haul. If your current trading style is not making these returns, we encourage you to consider our service. We are thankful to serve federal government employees & military personnel who continue to prosper from our valuable service! Our service has the best 'long-term' track record for trading the TSP Funds! Results of Year 2019 YTD (Close 04/16/19) — We are off to a great start in Year 2019. Our trading results are up +5.10% and rising. We are on pace for potentially a strong year with an estimate return of about +17-18%. The G Fund is up +0.78%. Cumulative Results (2005-2018) — Our IFT Allocation Service averages a profit of +13.41% per year. Over 14 years, our service continues to lead all other TSP advisory services. The average return for the buy-and-hold strategy is only +6.33% per year. 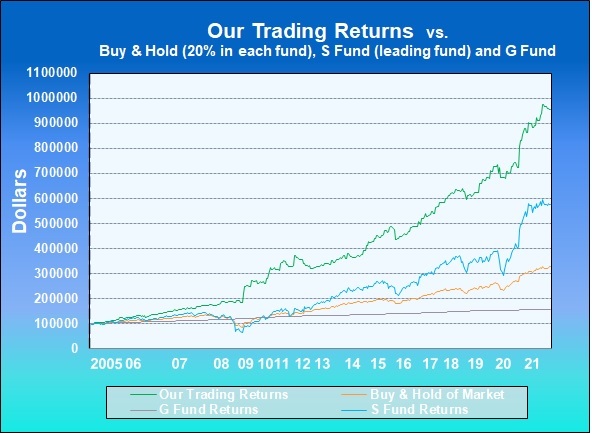 We outperform the buy-and-hold strategy by +7.13% each year. The G Fund returns an average of +2.87% per year. Calculating Periodic Returns and Compound Annual Returns. In addition to using technical analysis, we are now validating our interpretation by using a mechanical impulse system. The impulse system uses a combination of trend following and momentum, which maximizes gains when the market is trending. Become a member today to our valuable service and gain an understanding of the market in our very comprehensive newsletter. 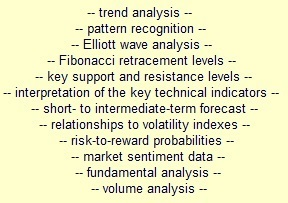 Our proprietary methodology uses technical analysis and gathers statistical information from past trading activity. We then analyze this information contained in technical charts to forecast the price direction of the Thrift Savings Plan funds — G Fund, F Fund, C Fund, S Fund, and I Fund. Our number one goal is to produce results that consistently outperform the buy-and-hold strategy of investing. The buy-and-hold is not a smart way to invest, since it takes years to recover when the market crashes. The two primary long term trends of the stock market are either a secular bull market or a secular bear market. Secular bull markets can sometimes last over twenty years. 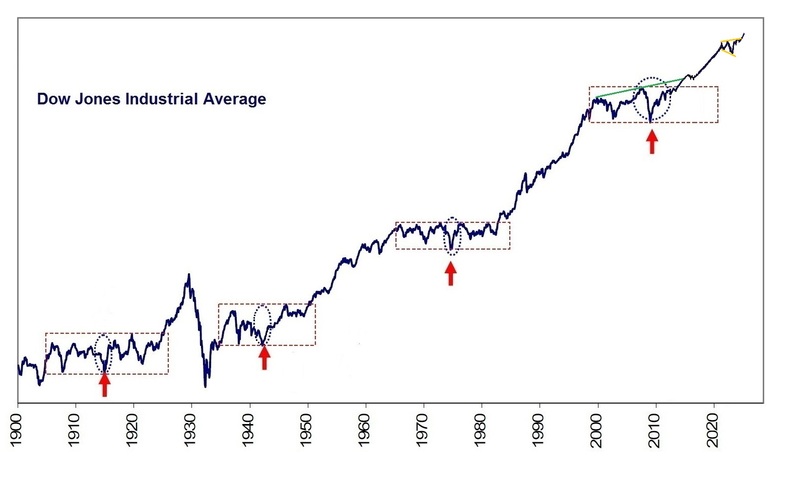 The most prosperous secular bull markets were from 1943-66 and 1983-2000. On the other hand, secular bear markets normally last between 10-14 years and sometimes longer. Viewing a twenty year chart of the S&P 500, note how the index was in a secular bear market from years 2000 to 2013. Within any secular market, there will be many bull and bear market cycles. The latest bear cycle occurred when the S&P crashed over 57% in 2008. 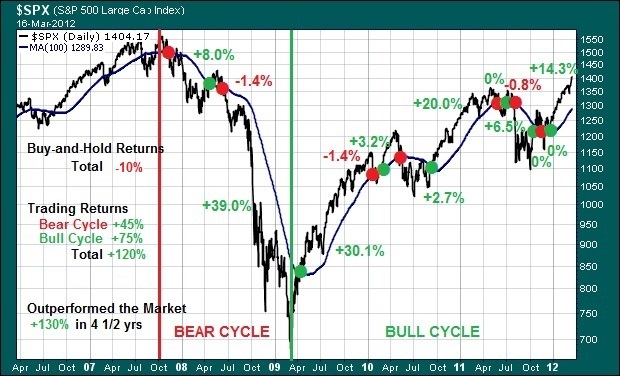 The market then experienced the next bull cycle beginning in March 2009. It is possible that the market will decline back to the highs of 2013. Our returns are independent of market conditions. Our track record shows a long-term consistency in outperforming the buy-and-hold strategy of both bullish and bearish cycles within secular 'long-term' bullish and bearish market environments. In all market conditions, it is essential that we trade our accounts so that: (1) we protect our capital during a crash within a bear cycle, and (2) continue to outperform the buy-and-hold strategy of investing in bullish and bearish cycles. 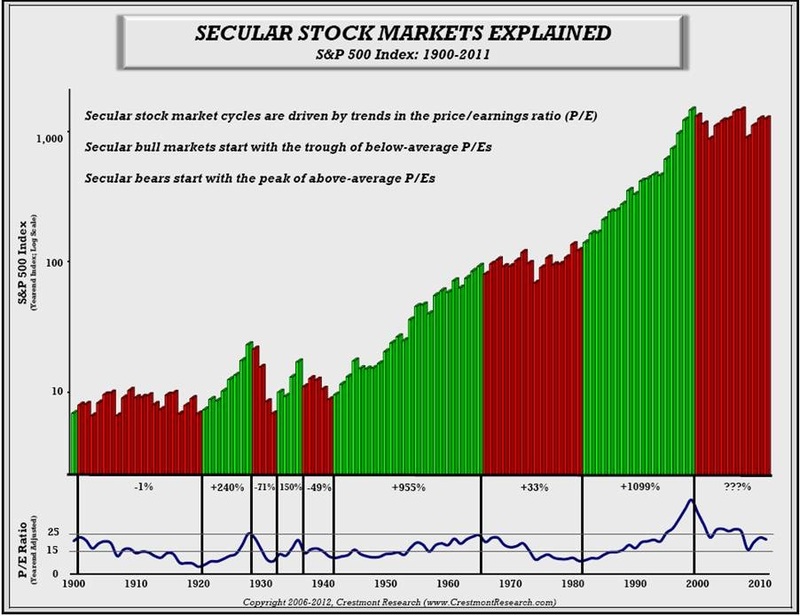 Reasons why it is imperative to trade the stock market as opposed to the buy-and-hold strategy can be viewed in a few charts which graphically show: (1) historical secular bull and bear markets of the Dow Jones Industrial Average, (2) secular markets explained by trends in the price/earnings ratios (P/E) of the S&P 500 Index, and (3) how just by using a simple price and moving average crossover technique applied to a bear and bull cycle of the S&P 500 Index will 'greatly' outperform the buy-and-hold strategy of investing. Our proprietary methodology focuses on analyzing the most important technical elements to properly forecast market direction. updates for the various thrift funds (G, F, C, S, and I Funds). This section will provide our current percentage breakdown for the various funds in order to achieve the highest-reward / lowest-risk results. Members will receive an e-mail and/or text alert when we believe it is best to make an Interfund Transfer; meaning there has been a change in percentage distribution of funds (see sample). Members will also receive an e-mail each Thursday, as a reminder that our weekly newsletter has been posted on the members page.